Sinusitis is a condition where the lining of your sinuses becomes inflamed and swollen. Your sinuses are the air-filled spaces in the bones around your nose. If you have sinusitis, you may have a blocked nose and pain in your face. 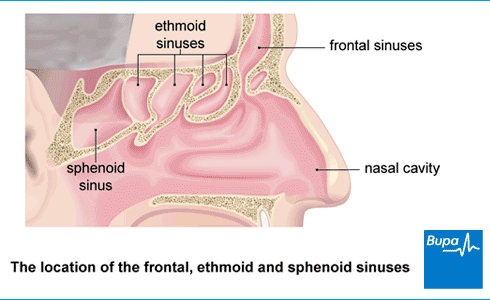 Sinusitis is inflammation of the lining of the sinuses that surround your nose. Sinusitis (swelling of the sinuses) can affect people of all ages. It can be very painful and may give you a congested or ‘blocked up’ feeling. Your sinuses are air-filled spaces behind your forehead and cheekbones. They’re connected to the inside of your nose. Doctors don’t know exactly what your sinuses do. But they may help to lighten the weight of your skull, control pressure and keep the air that you breathe in warm and moist. The lining of your sinuses makes mucus. Usually, this mucus drains away through your nose and throat. But if the sinus lining swells up because of infection or allergy, this can cause a blockage so the mucus can’t drain away. Sinuses can also get blocked by nasal polyps, which are fleshy swellings of the lining of your nose or sinuses – see our FAQ: What are nasal polyps? 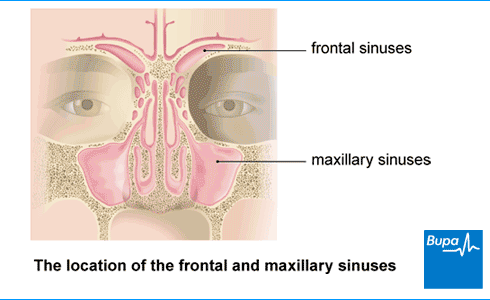 Your sinusitis can be acute (lasting for a short while) or chronic (lasting for a long time). Acute sinusitis is sinusitis that gets completely better within 12 weeks. Most people, though, feel better after two to three weeks. Acute sinusitis may be triggered by a viral infection, such as a cold. Chronic sinusitis is usually sinusitis that lasts for longer than 12 weeks. It often starts off as acute sinusitis but doesn’t get better. It may be caused by an allergy. Some people have repeated flare-ups of sinusitis – three or more in any year. This is called recurrent sinusitis. The main symptoms of sinusitis are pain and a feeling of pressure in your face. If you have acute sinusitis, your pain may be worse than if you have chronic sinusitis, which can feel like a dull ache. Your GP will ask you about your symptoms and examine you. Your doctor will also look for signs of inflammation or a blockage, which could be caused by nasal polyps – see our FAQ: What are nasal polyps? If your symptoms get worse after five days or last longer than 10 days but less than 12 weeks, your doctor may diagnose acute sinusitis. If after around 12 weeks, your symptoms haven’t gone away completely, you may be diagnosed with chronic sinusitis. Your GP will also check whether something else is causing your symptoms. This is because sinusitis symptoms can be similar to symptoms from other causes such as an allergy or problems with your teeth. If you have chronic sinusitis and your treatment hasn’t worked or your sinusitis keeps coming back, your GP may refer you to another doctor. This is likely to be an ear, nose and throat (ENT) specialist. Your ENT specialist may suggest you have a test called a nasal endoscopy. In this test, your doctor puts a narrow, flexible, tube-like telescopic camera (called an endoscope) into your nose. This helps your doctor to identify any blockages. You may need other tests too, such as a CT scan to diagnose sinusitis. Acute sinusitis usually gets better on its own after two to three weeks without any specific treatment. You may feel like you have a cold that’s taking longer than usual to clear up. If your symptoms are bothering you, you can usually ease these yourself. Take over-the-counter painkillers such as paracetamol and ibuprofen to ease the pain and any fever. You can try using a decongestant nasal spray if your nose is very blocked. But you should only use this for three-four days at the most. Don’t use oral decongestants (tablets or capsules) for sinusitis symptoms. Rinse your nose with a warm saltwater solution – your pharmacist can show you the best way to do this. Place a warm pack or flannel on your face to help relieve any discomfort. Drink plenty of fluids and get plenty of rest. Some people try steam inhalation to clear their blocked sinuses, but there’s little medical evidence that it helps, so some doctors may no longer recommend it. If your symptoms aren’t getting better after three weeks or they’re getting worse or you feel very unwell, see your GP. If you have chronic sinusitis, it may take a while for you to get better, sometimes several months. Your symptoms may cause you a lot of pain, but they should clear up eventually without you needing to see an ENT specialist. If your symptoms get worse every now and then (called an acute flare-up), you may find self-help measures will ease them. Try taking simple painkillers such as paracetamol or ibuprofen, or placing a warm flannel over the painful part of your face. For more details, see: Self-help for acute sinusitis. If these treatment measures are not helping to reduce your symptoms, make an appointment to see your GP. If you smoke, you may find that stopping smoking helps to ease your sinusitis symptoms, especially if you also have allergies. Ask your pharmacist for advice on quitting smoking. It may also help if you avoid places where you’ll be exposed to other people’s cigarette smoke. Alcohol can also make your symptoms worse, so you may want to consider avoiding it. Chronic sinusitis can also be linked to a dental infection, so have regular check-ups with your dentist, and brush and floss your teeth regularly. If your symptoms are very bad or last for longer than expected, your doctor may suggest you try a nasal corticosteroid spray. You will usually use the spray for two weeks. Your pharmacist can show you how to use it properly. Most people with acute sinusitis get better without antibiotics, though it can take two to three weeks for their symptoms to clear up. This is because sinusitis is usually caused by a viral infection rather than a bacterial infection, so antibiotics are unlikely to help. Even bacterial sinusitis often clears up on its own without antibiotics. It’s very hard to tell the difference between viral sinusitis and bacterial sinusitis just from your symptoms. So your doctor may prescribe an antibiotic if your symptoms are very bad or aren’t going away on their own after around 10 days. Your doctor may also prescribe an antibiotic if you have a medical condition that makes you more likely to have complications from sinusitis. This may be because you have a problem with your heart or lungs. If you need antibiotics for sinusitis more than three times a year, your GP may refer you to an ear, nose and throat specialist. If you have asthma, hay fever or a dental infection as well as chronic sinusitis, it’s important to treat these properly. This should help to ease your sinusitis symptoms. So speak to your GP, pharmacist or dentist. Your doctor may prescribe a nasal corticosteroid spray, especially if you have hay fever as well as chronic sinusitis. They may suggest you use the nasal spray for up to three months. Your doctor may suggest a three-to-four week course of antibiotics to treat the infection and reduce the risk of it returning. If these measures don’t work, your GP may then refer you to an ENT specialist. Most people with chronic sinusitis don’t need surgery. But if your symptoms are very bad and aren’t getting better with medicines, your ENT specialist may suggest you have an operation. An operation can help to unblock your sinuses so your mucus drains out of your nose more easily. If you have functional endoscopic sinus surgery (FESS), your surgeon uses a thin, flexible telescope called an endoscope to see inside your sinuses. Then they use special instruments to unblock your sinuses, by removing some of your bone and mucus lining. This can be done under local or general anaesthesia. If you have a balloon sinuplasty, your surgeon puts a small, flexible tube into your sinus and inflates a balloon on the end of it. This unblocks your sinus and helps it to drain properly. You’ll usually need to have a general anaesthetic for this operation. If nasal polyps are causing a blockage in your nose or sinuses, you may need to have surgery to remove them. For more information on nasal polyps, see our FAQ: What are nasal polyps? Speak to your doctor about the different types of surgery and whether any of them are suitable for you. Acute sinusitis is caused by an infection of the lining of your sinuses. Most people with acute sinusitis have an underlying viral infection such as a cold or flu. Only around two in every 100 people with acute sinusitis have a bacterial infection. Acute sinusitis usually goes away on its own without causing any complications. Sometimes though, the symptoms don’t go away after the infection has cleared up. If your sinusitis symptoms last for more than 12 weeks, this is called chronic sinusitis. Very occasionally, a bad acute sinus infection can spread to the bones in your face or your eye socket. The infection could also spread to your brain and cause meningitis. But this is very rare and unlikely to happen in most people. If you have a bad headache, stiff neck, high temperature or are sick (vomit), get medical help as soon as you can. If your eyelid becomes red, painful and swollen while you have sinusitis, you could have an infection in the soft tissues around your eye. This is called orbital cellulitis and can lead to a severe infection and sight loss. If you notice these symptoms, see a doctor straightaway. You may be able to lower your risk of getting sinusitis by following a few simple measures. Wash your hands well using soap and hot water or anti-bacterial hand rubs or gels. This is especially important if you’re in close contact with someone who is unwell. Don’t smoke and try not to spend too much time in smoky places or areas with heavy air pollution. If you have allergies that may trigger sinusitis, try to steer clear of your allergy triggers. Treat any colds, flu and chest infections quickly to stop them leading to acute sinusitis. You can usually treat these yourself using medicines from your pharmacist. If you keep getting sinusitis because of an allergy, you may find it useful to have allergy tests. Your GP or ENT specialist can usually arrange this. Can I fly if I have sinusitis? Can I fly if I have sinusitis? You can fly if you have sinusitis. But flying can cause pain in your sinuses, especially when the plane is landing. So you may wish to delay your flight until your symptoms have gone away. When you’re in a plane, the pressure inside the aircraft changes and air inside your sinuses expands and shrinks. If your sinuses are blocked or inflamed, the air inside them gets trapped, which can be painful. Using a decongestant spray or drops just before the flight, and just before the plane starts to descend for landing, may help to relieve your symptoms. What are nasal polyps? What are nasal polyps? Nasal polyps are fleshy swellings of the lining of your nose and sinuses. They look like small grapes, or clusters of grapes, in your nose. They’re often associated with an allergy or infection, but the cause may also be unknown. It’s not clear why some people have nasal polyps and other people don’t. The polyps can cause a blocked nose, as well as sneezing, itching, a runny nose and a poor sense of taste and smell. They can block your sinuses, so you may be more likely to have sinus infections too. Nasal polyps don’t always need to be treated. But if they’re bothering you, using a nasal corticosteroid spray may make them smaller. It can take up to six weeks for the nasal sprays to work, but you can use these to control your symptoms for many years. If the nasal sprays don’t work or the polyps are blocking your airways or sinuses, you may need to have surgery to remove them. After surgery, you should be able to breathe more easily. But your nasal polyps may come back again after around four years.